Yeah, might just be something boring, like a parking garage. Well... the pic really looks like a very simple Photoshop job. Isn't there something more convincing? The hole looks a pefect circle. The questions are: 1) what is inside there, how deep is it and what is its inside formation? 2) how was it formed? The circular formation points to the possibility of its forming by an impact of astroid of the sufficient size to have this depth. If such an impact takes place on earth, the resultant hole would not be that circular and deep. Which are those conditions on earth that prevent that shape and depths? This would show those conditions are not present there on Mars. 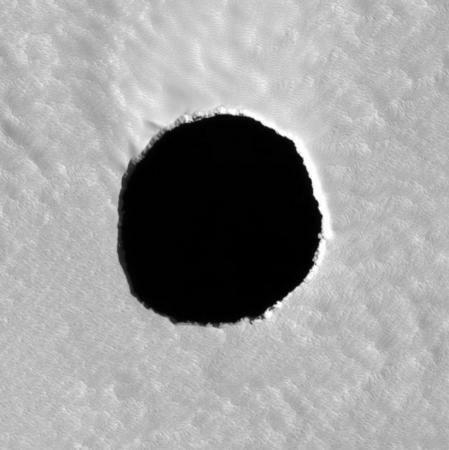 An impact would normally have thrown some stuff up around it, and it wouldn't be such an apparently bottomless hole. Unless there already was just a thin shell above an existing cavity, and the meteor went straight through. But what's underneath is the real mystery. Is the whole place hollow? 31 May 2007 @ 22:46 by osvaldo @201.54.121.94 : Big hole??? Cave! and the rim?? do not look like a cave. look like a lake. 6 Jun 2007 @ 21:56 by Boonie @63.144.17.200 : What has me puzzled.. I'm pretty new at looking at these photos so please feel free to educate me. I am viewing the hole shown above with the IAS Viewer. At the top of the hole appears what I will call islands in the dark. Now look at the right hand side of the hole and you will notice that at the top of the hole wall it starts out bright and is fairly consistent until it gets about halfway down then turns to a darker grey until it reaches black. This, for lack of a better term, grey water line, appers level around the rim. I wonder if we are looking through something like when you see a lake or smoke filled crater from an aerial photo here on earth. Could it be a heavy fog or gas that is filling the hole? As a firefighter we use thermal cameras and the blackness reminds me of when you look at certain items like water. Could the reason we are unable to see into the hole be due to a spectral limitation on the camera with regards to whatever is filling it? Also does anyone know if this hole is on an angled or flat surface? THE PRESENCE OF CAVES OR VAST CAVERNS IN MARS IS UNDERSTANDABLE BECAUSE THE RED PLANET - MARS - BILLIONS OF YEARS AGO WAS JUST LIKE PLANET EARTH, GREEN IN HABITATION, BLUE IN ITS ATMOSPHERE AND PLENTY OF WATER AS SEAS AND OCEANS. ALMOST HALF A MILLION YEARS AGO, IT WAS A SPACE "WAY STATION" FOR EXTRATERRESTRIALS, MINING GOLD ON EARTH AND BRINGING THEM TO THE PLANET WHICH PASSES CLOSET TO EARTH EVERY 3,699 EARTH YEARS AND ORBITING AROUND THE SUN LIKE A 'TWELVE PLANET' TO THE SOLAR SYSTEM, ALONG A CIRCUIT IN THE ASTERIOD BELT WHICH THESE ETS CALLED 'THE HAMMERED BRACELET'.EVEN NOW, ON THE SURFACE OF MARS, OUR MODERN DAY ASTRONAUTS HAVE SEEN AND HAVE TAKEN PICTURES OF A VAST GIGANTIC HUMAN FACE NEAR SEVERAL GIGANTIC FOUR-SIDED PYRAMIDS, EXACTLY THE SAME AS WE SEE AND KNOW IN THE GREAT PYRAMIDS AND SPHINX IN EGYPT... AFTER ALL THE BUILDERS OF THE EARTH AND MARS PYRAMIDS ARE ONE AND THE SAME ET RACE - THE IGIGI AND ANUNNAKI, COSMOLOGICALLY KNOWN AS NIBIRUANS BY THE ANCIENT SUMERIANS OF EARTH CIVILIGATIONS OF EARTH. thanks Fleming Funch. Perhaps it’s the remains of an extinct caldera, the large magma chamber collapsed in on it’s its self, this would explain the over hanging edges and depth better than a impact creator. Perhaps it’s the remains of an extinct caldera, the large magma chamber collapsed in on its self, this would explain the over hanging edges and depth better than a impact creator. They look like an underground spherical cavity where the top has collapsed inward where the top of the sphere is closest to the surface. 26 Aug 2016 @ 06:22 by Vasili @36.84.1.80 : Thanks!